Own Captain Kirk's command chair! Full-size sci-fi prop replica of the Enterprise's captain's chair. Star Trek limited edition with lights, sounds, phrases, armrest controls, and more! All the accents and details of the original. Bonus miniature replica of the chair with Captain James T. Kirk included. Boldly go where no fan has gone before! Throw away that Lay-Z-Boy. Here's a life-size throne fit for a captain! 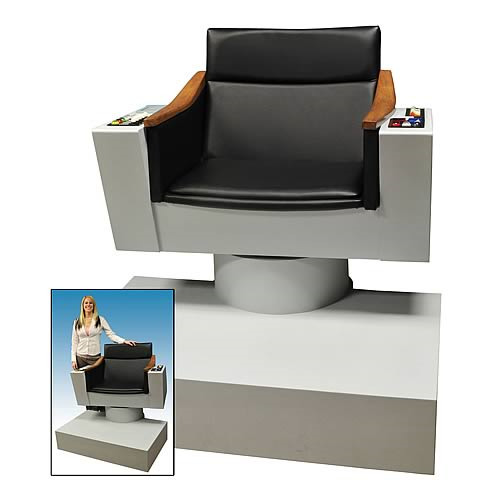 With the sci-fi status and geek grandeur of Captain Kirk's command chair in your collection, you can boldly go where no fan has gone before! This full-size prop replica of the U.S.S. Enterprise's captain's chair is designed from detailed drawings supplied by Paramount Studios and is approved by Paramount. It delivers all the accents and details from the historic prop, along with modern lighting, sound effects, and phrases designed to thrill any Star Trek enthusiast. It's the ultimate prize from the Enterprise! The unbelievable captain's chair measures 41-inches tall x 42-inches wide x 39-inches deep. It weighs about 215 pounds! The working swivel seat with wooden handles, leather seat cover, and armrest controls make this the perfect addition to any collection, display, home theater, or museum! The chair, seat of the chair, and arms of the chair are made of wood, with the seat covered in leather. For rigidity, it's mounted on an iron base. Limited edition of 1,701 pieces worldwide. "This is Captain James Kirk of the U.S.S. Enterprise." "Lt. Uhura, open a channel to all decks." "Security Alert to all decks. Kirk out." "Kirk to Engineering, Mr. Scott report." "Prepare to attack, all hands battle stations." "Resume course to our next destination, Mr. Sulu." Special Bonus! Every purchase also comes with an authentic miniature replica of the Life Size Captain's Chair with Captain James T. Kirk. Show it off in your office, club, work area, or family area where you display all your other Star Trek collectibles! The chair comes in two separate boxes. Carton dimensions of chair: 42-inches x 29 1/2-inches x 40 inches. Carton dimensions of base: 45 3/4-inches x 39-inches x 20 1/2-inches.